Oh boy, where to even begin? With the warm weather upon us it seems like real estate sales in Toronto are melting like ice cream left in the sun for too long, and the world’s attention is turned squarely on the meetings between world leaders for the G20. Of course, there are so many headlines that it’s easy to miss some of the stories that aren’t being generated 140 characters at a time. Paying attention to the slow and steady stories can be quite revealing, however, especially when it comes to Canada’s discount brokerages. In this ‘trend’ filled episode of the weekly roundup, we kick things off with a look at the latest website update being telegraphed by a bank-owned online brokerage and what might be coming down the wire for the second half of the year. From there, we take a very interesting look at some possible macro factors swirling around the online brokerage industry in Canada that could substantially reshape and redraw an already dynamic landscape. Fortunately, we wind up the roundup on a familiar note with tweets from DIY investors and the latest chatter from the investor forums. Summer is a great time to do renovations and upgrades, and not just around the house. 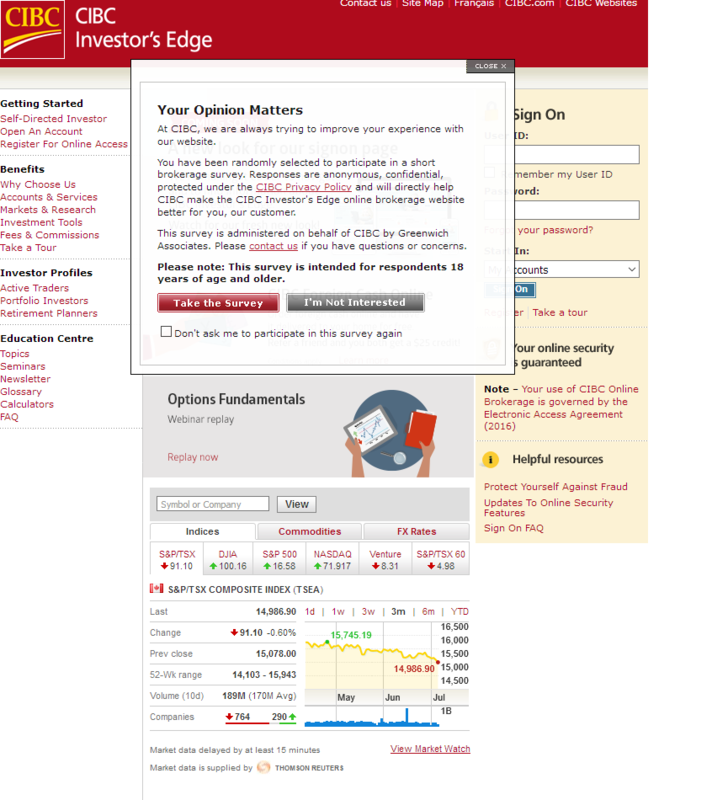 This past week, CIBC Investor’s Edge posted a notice on their website indicating that some updates and upgrades are in the works for their website front end. But it wasn’t just the announcement that caught our attention, it was also a survey that popped up while on the homepage. Specifically, an online survey that sought out feedback from CIBC Investor’s Edge clients on certain features and functionality related to their online experience as well as the overall satisfaction with certain components of the CIBC Investor’s Edge offering. If some of this sounds familiar, it is because in April, another online brokerage, Credential Direct, also posted a user survey to help provide guidance on functionality prior to launching their new website. Unlike the survey in April, which was focused on how individuals would locate certain information on a new website, the survey by CIBC Investor’s Edge seemed to looking for satisfaction with experience and taking a top down approach to establishing where improvements might be required. In the first half of 2017, in fact, that there appears to be renewed interest and resource being devoted to improving the online user experience, especially at the bank-owned brokerages. Several website launches, staffing up in digital content and experience and a general shift towards releasing features to market more quickly all signal that Canada’s discount brokerages are gaining ground and learning from the ‘fintech’ model that is gaining a foothold in the wealth management space. That said, it also points to the likelihood that changes are going to be more frequent and prevalent. For the last half of 2017, there are strong odds that we’ll see some very big announcements from certain discount brokerages on new website roll-outs of their own. 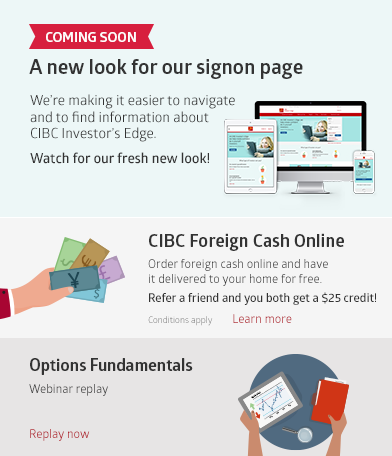 In the meantime, we’re excited to see what CIBC Investor’s Edge unveils and the accompanying response from DIY investors and clients on the new website format. Unlike some of the more obvious changes and developments in the Canadian discount brokerage space, there appears to be a handful of ‘macro’ trends that might steer the news and behaviour in the near future. What does that elusive opener refer to exactly? Over the past few months, the regulatory landscape around the Canadian online brokerages appears to be shifting. There are two forces at play from different government entities that could drastically reshape how DIY investors access online brokerages’ services and, perhaps, severely constrain the DIY investor space as a whole. On the one hand, there is the issue raised by IIROC on the nature of what Canadian online brokerages (as order execution only entities) can provide in terms of tools or features that cater to investors. Specifically at issue, is what constitutes a recommendation and how much autonomy an individual investor may have in deciding what is or isn’t appropriate for their own investing objectives. While this is an important point, part of it has been covered in a previous roundup which serves as a prelude to this second, and perhaps more disruptive issue. For the last few weeks, the story of the Canada Revenue Agency’s purported ‘crackdown’ on TFSA windfalls has been gathering media attention and investor ire. Thinking of trading in your #TFSA? You may want to rethink that as CRA raises $75M from audited TFSAs https://t.co/ESOrT0Hj5w . Although this is not the first time that the CRA auditing TFSA account compliance/performance has made news, what is making the news is the rather large sum of $75 million that has been flagged for collection, an indication that efforts to regulate TFSAs has escalated. Before proceeding, there is an important caveat to state, and that is that the CRA ensuring that individuals don’t abuse the tax system is ultimately a net benefit for everyone. That said, the TFSA is a very interesting (and recent) vehicle for wealth building and it is that wealth building that finds itself at odds with a tax system (and it’s rules) for investors that was developed well before the democratization of information on and about securities (such as stocks). And, while there are lots of very interesting angles to the evolving TFSA crackdown story, at the heart of the issue for DIY investors and for financial advisors, wealth managers and ultimately for online brokerages is what exactly constitutes ‘trading’ versus ‘investing’. Without delving too far into the past, the CRA has published guidance on the subject of what may or may not constitute a trader but for many DIY investors and the industries that service them, the definition has been far too open ended. From an armchair analyst’s point of view, the issue appears to be ensuring that capital gains should get treated differently than business income, so separating what counts as either is crucial to administering the tax-preferred treatment that capital gains get. While, from the CRA’s perspective, this approach might afford the flexibility to evaluate cases on the merits of particular facts, the counterpoint is that is has created tremendous uncertainty. And, if there’s one thing that efficient markets disdain, it’s uncertainty. As a result of the somewhat vague test of what could or could not constitute an “adventure or concern in the nature of trade” situations like the following can arise. Clearly, if individuals are DIY investors, there’s a reasonably good chance they may also want to use software that helps to take a DIY approach to taxes. In fact, there are examples of some Canadian online brokerages who’ve offered incentives such as discounts on this software as a sign up bonus, so there’s a good chance resourceful individuals might turn to such a document to help figure out how to populate their tax returns. Clearly, anyone with a margin account who decides to short a stock needs to consider treating such a transaction differently for tax purposes than does anyone going long on an investment – but good luck to DIY investors trying to stumble across this information easily. Considering the points above, one very interesting angle is the moving target on what constitutes an active investor, specifically because this impacts how Canadian online brokerages communicate to DIY investors considering opening an online investing (or trading) account – including a TFSA. The table below shows that an “active” investor is being communicated differently depending on the discount brokerage. For the CRA, and in the case cited in the Golombeck article above, it may not be interpreted the same way by everyone and that is highly problematic. *some firms may appear twice as they have offers in each tier. Add to this, the fact that there are also incentives that are being offered to individuals (such as discounted commissions or waived platform fees) depending on the number of trades executed. The range is quite extraordinary, going from 30 trades per quarter to as high as 150 or more per quarter. Of course the other issue with being an ‘active’ investor is the time spent researching and following markets, as well as the level of knowledge of the markets. Both of these components are used in the test to establish whether an individual is considered to be generating business income or is eligible for the capital gains exemption. To do due diligence, however, does require time and effort – even in passive portfolios, to rebalance, read and generally know what you’re buying into. Finally there’s the pricing for data feeds for active trading platforms. For business (such as sole-proprietor) investing/trading accounts, the data feed costs are significantly higher than for individual accounts, which means that the true cost to active investors who may not want run afoul of the CRA criteria is actually quite high. That’s bad news for the online brokerage industry who would now have to communicate the value proposition of being an active trader, doing so outside of the TFSA (potentially) and incurring huge data and platform fees. Interestingly these two issues, that of the suite of services offered by order execution only (OEO) firms and what the CRA appears to be doing with TFSAs might actually intersect. The fact of the matter is there is insufficient clarity on several fronts: what determines ‘trader’ or ‘investor’, the degree to which an individual who opens an account with an online brokerage firm can or cannot decide for themselves as to the level of ‘appropriateness’ of executing a particular transaction and the implication for them doing so in a TFSA. In fact, it seems like there is a slight misalignment between the list of criteria put forward by the CRA in terms of “knowledge of securities” and the KYC rules put forward by securities regulators that would enable an individual investor to perform transactions in TFSA. On the one hand, individuals may be taxed for knowing too much about securities but on the other hand they may not be able to access tools from their online brokerages because they might not know enough. In this case, it begs the question, does something need to change about the way TFSA accounts can be used by online brokerages? According to the Golombeck article cited above, the CRA’s position appears to be that TFSA’s are not that special. That said how do the CRA’s tests for being considered a trader (for tax purposes) mesh with securities regulations that require online brokerages to determine, at some level, the degree to which an individual would be knowledgeable enough about securities to open an account and appreciate the extent of risk associated with online investing? There’s certain to be much more debate on these issues ahead as the CRA had opened the can of worms of counting ‘wins’ in DIY investor TFSAs as business income but not necessarily equally considered losses obtained through the same set of activities as ‘business losses’ (if they have, it’s not been as widely reported). Similarly, reconciling tax requirements with securities legislation is sure to come up especially if it can potentially hurt DIY investors in their journey to save for retirement. This very tangled set of issues will be fascinating to watch unfold, and as usual for DIY investors, the playbook seems to suggest: be ready to change. A somewhat quiet week by Twitter standards. Mentioned this week were CIBC Investor’s Edge, Interactive Brokers, Questrade, Scotia iTRADE and TD Direct Investing. So much for keeping it short. Well, on the topic of shorts (not the trade but summer attire) have a great weekend and hopefully enjoy some of that summer weather while it’s still here!